Clusters of beautiful clear yellow fully double blooms, fading to lemon with age, with a moderate perfume. 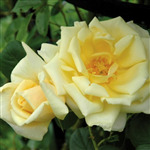 Clusters of beautiful clear yellow, fully double blooms, fading to lemon with age, with a moderate perfume. Foliage is dark green and healthy, an ideal pillar rose. The rose ‘Stamford’s Sanctuary’ has been commissioned by the National Trust’s Dunham Massey in Cheshire, as part of Trust commemorations marking the centenary of the First World War. Between 1917 and 1919 Dunham Massey became the Stamford Military Hospital, where many wounded ‘Tommies’ from the trenches were cared for. This year Dunham has been transformed back into the hospital, and ‘Stamford’s Sanctuary’ will be a lasting legacy to its role as a refuge from the horrors of war.